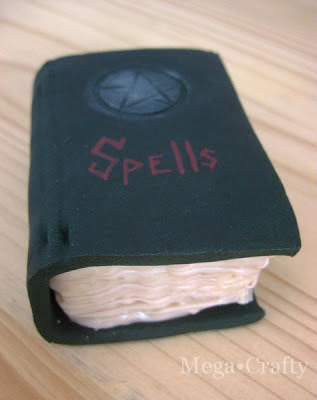 I've done a bit of confectionary conjuring. 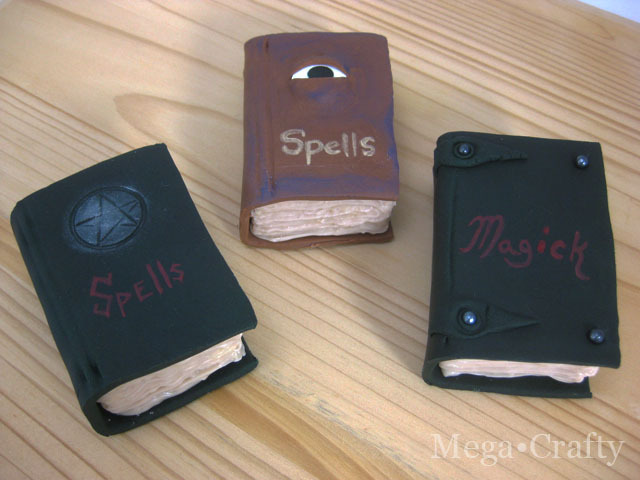 The result- scrumptious little spell books that come together so quick it's like... well... magic! 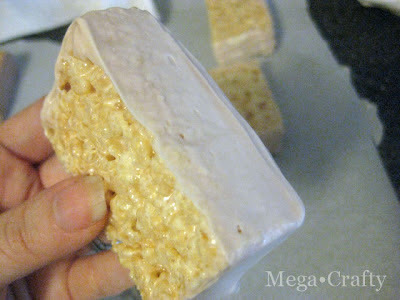 I know Halloween is only a few days away, but I promise these really are very easy to make. You can decorate them as fancy or as simply as you like. And the kiddos can help because these are no-bake! 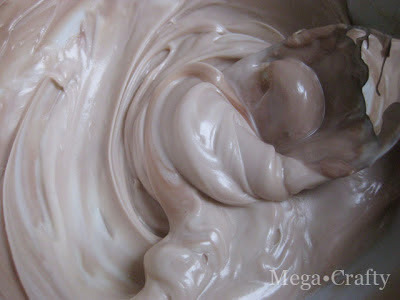 Next melt some chocolate candy- this will be for the pages of the book. I wanted the books to look old and weathered so I "dirtied" up the color of my white chocolate by adding a little regular chocolate and a touch of yellow chocolate. 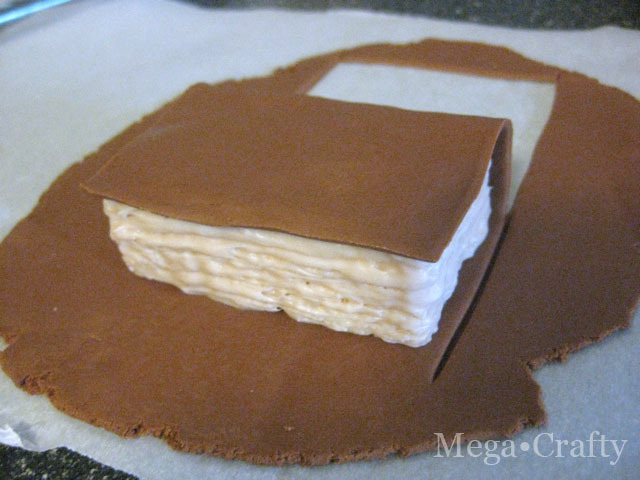 (You could also just add a tiny bit of black or brown candy coloring). 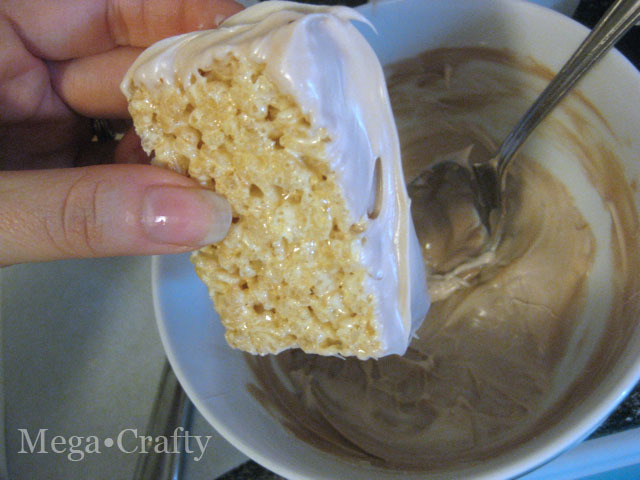 Once the chocolate is melted, dip three edges of the cereal treat into the chocolate. 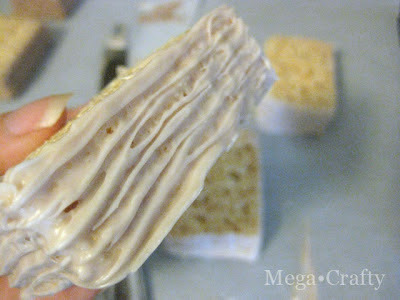 Smooth it with a butter knife or offset spatula. Scraping off any excess chocolate back into the bowl. 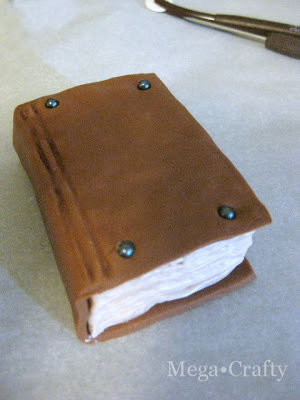 Then drag the tines of a fork through the chocolate to make it look like pages. As I dipped and dragged my treats, I placed them on parchment to let the chocolate set. 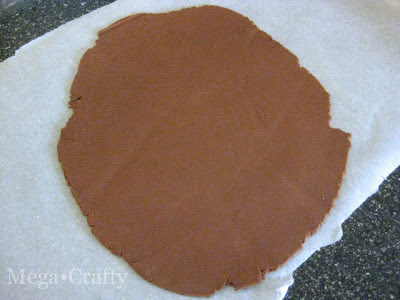 While the treats were drying I rolled out some brown and black fondant. 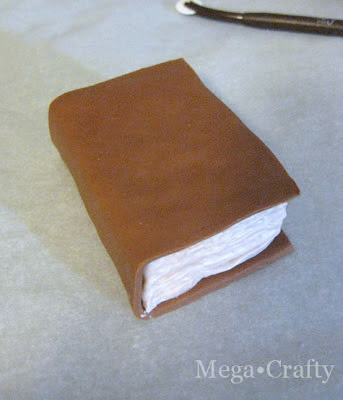 Place a treat onto the fondant and cut around the treat on the three chocolate covered sides. Roll the cereal treat and fondant over so the fondant covers the top of the treat and the non-chocolate coated edge. Then cut around the three remaining fondant edges. Now you have a book that can be decorated any way you like. Before the fondant dried I put little sugar pearls on some. I also gave a few books an eye by pressing edible sugar eyes onto the front and covering the edges with more fondant. I also used a skewer to press emblems and crease lines into cover. Once the fondant firmed up a bit I painted designs onto the covers using powdered color mixed with vodka (don't worry the vodka evaporates). Food coloring pens, or gel colors and a brush could be used instead. 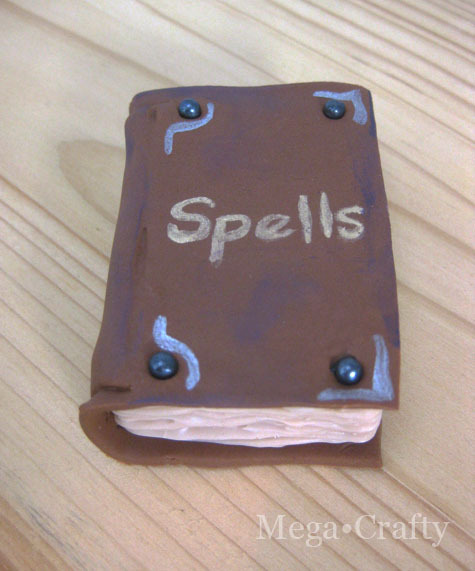 Finally to give my brown books a bit of age, I rubbed them with some purple powdered color. Wrapped in individual plastic treat bags these make wonderful party favors or classroom treats. 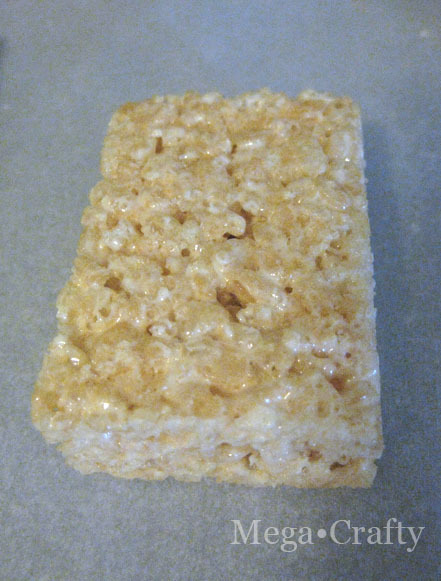 Mine will go to a few special Trick-or-Treaters on Halloween night. Brilliant, brilliant, brilliant!!! How do you think these things up? You are right - simple and quick - and i absolutely love how they turned out! So glad you were at least able to indulge in a bit of fun this Halloween. Thank you for sharing the magic! Aww thanks Ladies! 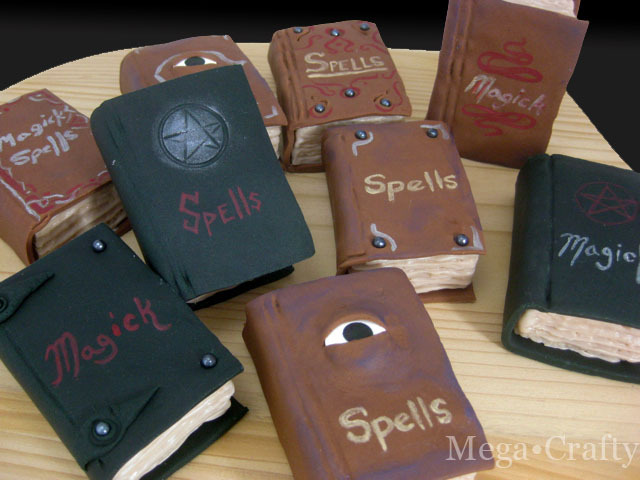 These were really fun to make- glad I got to make them before Halloween was over! Wow, these are just wonderful! So real! Those are extremely creative. 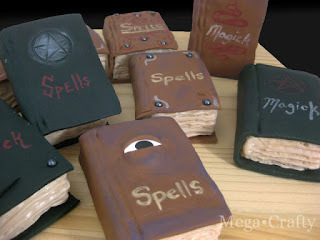 I have seen a lot of Halloween food recipes recently and your book treats are some of the best ones. What a great idea! 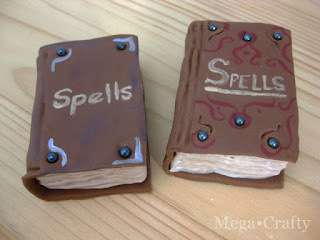 Love the books!!! I'm so happy that you had stopped and left me a comment on my blog because I now found you! I love your blog, you are so talented and crafty! Like me, lol! Anyways I am your latest follower! oh my gosh, that is amazing. the one with the eye reminds me of the book in hocus pocus, which of course, must be watched every halloween season!